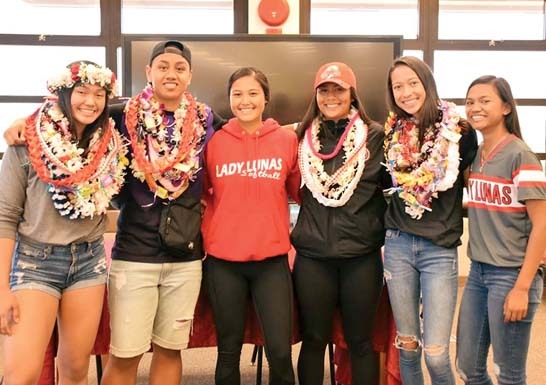 PUKALANI — The Lahainaluna High School football team has convincingly stamped itself as one of the best teams in the state, regardless of classification. The two-time defending Division II state champions clinched their 12th straight trip to that state tournament with a commanding 47-0 win over Kamehameha Maui at Kanaiaupuni Stadium on Friday night. The Lunas (7-0) won their 18th game in a row overall, the second-longest winning streak in the state behind top-ranked Saint Louis. Lahainaluna is ranked fifth in the state by the Honolulu Star-Advertiser and sixth by scoringlive.com. 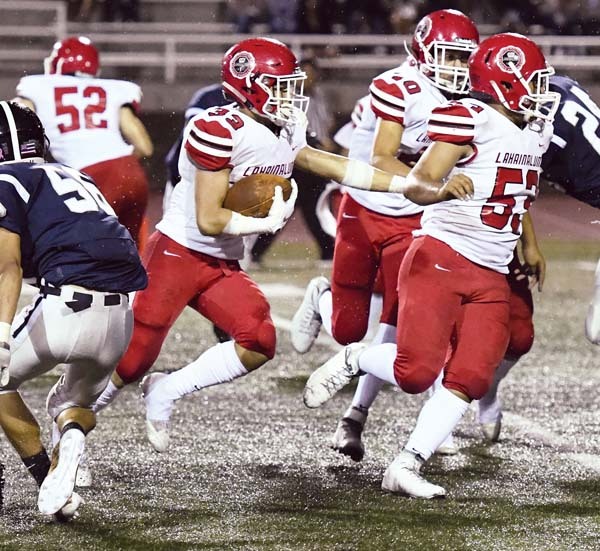 “We really, really studied during the week, but the defense again, lights out,” Lahainaluna co-head coach Garret Tihada said. 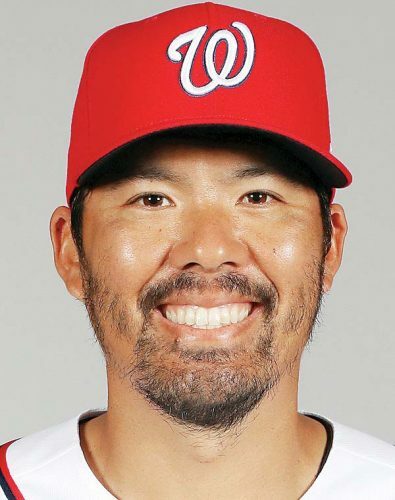 Lahainaluna has outscored seven MIL opponents 259-19. The game with the Warriors matched the top-ranked offense in the MIL — Kamehameha Maui came into the game averaging 400.4 yards per game — against the Lunas’ top-ranked defense. The Lunas held the Warriors to 61 yards of offense and seven first downs, two in the second half. The Lunas intercepted three Warriors passes on the night. 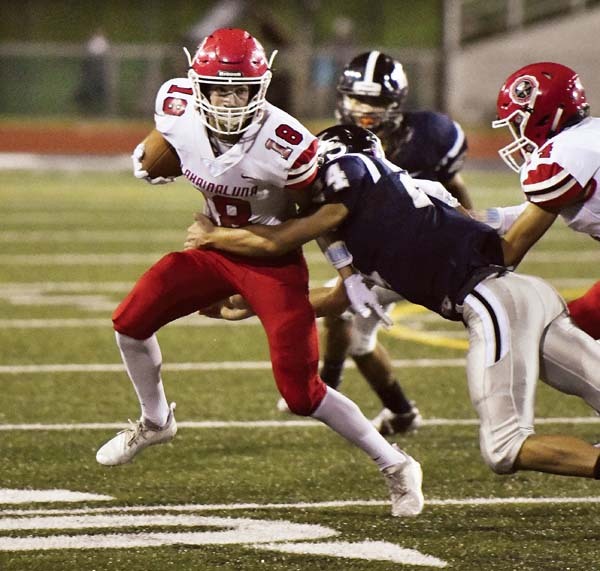 Lahainaluna gained 385 yards of offense — 197 on the ground, 188 in the air. 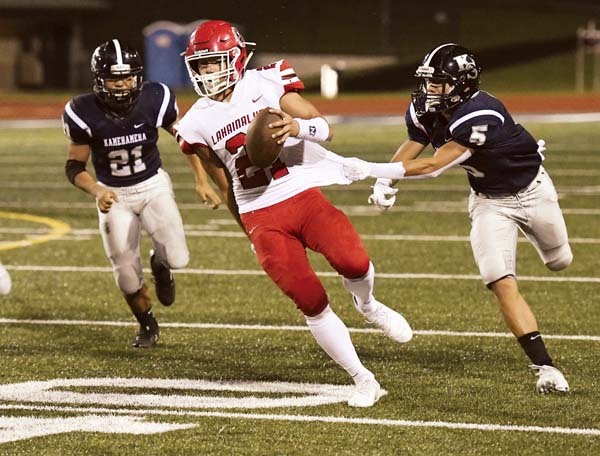 Lahainaluna turned on the mercy-rule running clock when Joshua Tihada dove in from 1 yard out to make it 38-0 with 6 minutes, 6 seconds left in the third quarter. Then in a span of nine seconds, the Lunas pushed the lead to 47-0. They blocked a punt out of the end zone for a safety with 58 seconds to go in the third quarter and then Devon Sa-Chisolm returned the ensuing free kick 56 yards for a touchdown. The Lunas rolled to a 31-0 lead at halftime on the strength of a balanced attack. Tihada ran for two scores and Nainoa Irish threw two long touchdown passes. Tihada’s 16-yard scoring run capped a six-play, 40-yard drive on the Lunas’ opening possession. The short field was set up by a 19-yard punt return by Tre Rickard. 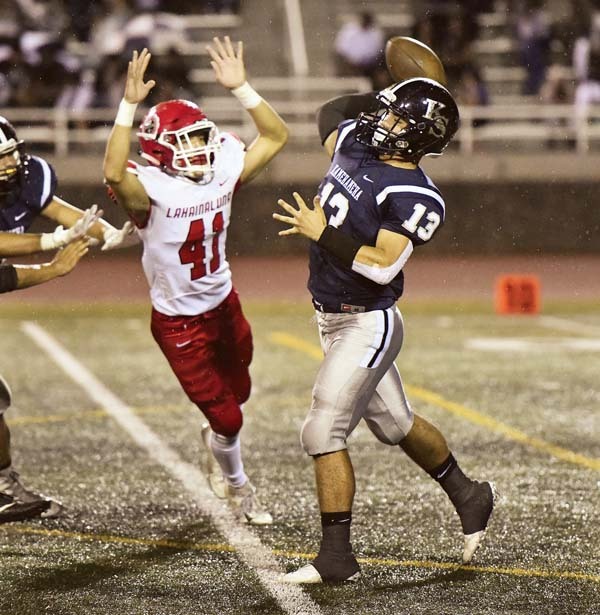 The Warriors defense stopped the Lunas after a 10-play drive on their next possession, and Pablo Rico upped the lead to 10-0 with a 21-yard field goal. Lahainaluna needed just three plays to cover 51 yards, pushing the lead to 17 on a 36-yard strike from Irish to Kawehi Gillcoat on the first play of the second quarter. Irish hit Kaihulali Casco on a pass downfield on the next possession — Casco rose above his defender, snagged the ball and finished a 75-yard scoring pass with 9:24 left in the half. Tihada’s 3-yard touchdown run gave the Lunas five scores on their first five drives — this time they covered 64 yards in six plays to take a 31-0 lead. Tihada ran three times for 19 yards on the drive. Kamehameha (3-3) had its best drive on its final possession of the half, going 67 yards in 14 plays, but were stopped on downs at the Lunas’ 13-yard line with less than a minute to go in the first half. The drive was helped by a rough-the-punter penalty that gave Kamehameha Maui a first down on the Lunas 34. Warriors coach Ulima Afoa declined comment after the game. The Lunas are the likely No. 1 seed in the six-team Division II state playoffs, meaning they will probably not play another meaningful game until Nov. 17. They do have a make-up game against King Kekaulike slated for Oct. 27 at Sue Cooley Stadium. LL–Joshua Tihada 16 run (Kaihulali Casco kick), 7:26. 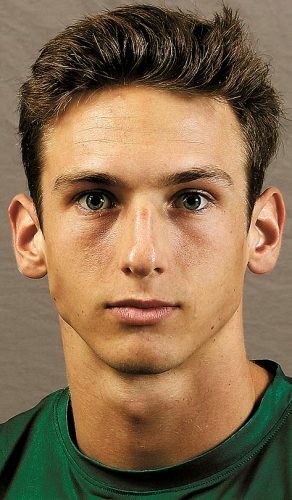 LL–FG Pablo Rico 21, 1:41. LL-Kawehi Gillcoat 36 pass from Nainoa Irish (Casco kick), 11:54. LL–Casco 75 pass from Irish (Casco kick), 9:24. LL–Tihada 3 run (Casco kick), 6:41. LL–Tihada 1 run (Casco kick), 6:06. LL–Safety, punt blocked out of end zone, 0:58. LL–Devon Sa-Chisolm 56 punt return (Casco kick), 0:49.